The asylum application procedure (asylum procedure), already greatly modified in 2015, has just been significantly changed again by law number 2018-778 of September 10th 2018 “for a controlled immigration, a real right to asylum and successful integration” (“pour une immigration maîtrisée, un droit d’asile effectif et une intégation réussié”) which reformed the Ceseda (« Code de l’entrée et du séjour des étrangers et du droit d’asile » or “code for entry and residence of foreigners and for the right to asylum”). As per usual in the field of foreigners’ rights and asylum, the legislators did not intend to simplify the procedure but, on the contrary, made it even more technical and difficult to understand either by asylum seekers or by the people who help them. Another law, number 2018-187 of March 20th 2018, "allowing a good application of the European asylum system" is specifically aimed at people in the Dublin procedure, reinforcing the coercion of an already extremely precarious population. Reception policy has been in crisis for years. A crisis organized by France itself, which instead of trying to really welcome people and adapt its system (centers for first reception, reception at the police prefecture, housing in sufficient numbers, true administrative, social and legal assistance), chooses instead to control people even more and turn away as many people as possible. All this using a legal arsenal, the best known being the Dublin Regulation, to determine the responsible country. This regulation is used excessively, when all the countries of the European Union know that they cannot force people to stay in a country in which they do not want to settle, and in defiance of law and common sense, increasing the number of forced deportations, back-and-forth trips, or techniques for massively turning away people at borders. France itself has never complied with its obligations regarding the reception of asylum seekers and, for many years, has preferred to mistreat them, thinking that people will leave and spread the message that France is not welcoming. Despite the measures taken by the authorities to put an end to refugee camps, they do not disappear but move and split up, gathering just a few dozen people, or a few hundred in some cities. In the Paris region, it still takes months before one can begin an asylum procedure. What is new is that the queue has become invisible since the establishment of a telephone number, difficult to get through to, to get an appointment at the first reception center. As for the refugees evacuated from previous camps, a good portion of them end up in centers scattered all over the country lacking not only the means and personnel competent in asylum cases, but which—more importantly—are used to “shelter” these people while organizing their deportation, whether asylum seekers whose requests were refused—still very numerous —or people waiting for a Dublin transfer (more than 40 000 in 2017 or more than one third of all asylum applications in France). Although it is impossible to list all of the traps set by the administration, these fact sheets aim to provide the information required to submit an asylum application, and obtain one’s rights. In all cases, we try to find together solutions to help you (mail, court appeals…). People are received according to the emergency of the situation : people in Dublin procedure and need to make an appeal, people who have a refusal from OFPRA or people who did not manage to register their request for asylum at the end of the Dublin procedure (6 month) (those considered to be "escaping"). All the participants are struggling by your side and support you in the difficulties you face with public services. We have no links with services in charge of refugees reception (Prefecture, OFPRA, OFII or any association commissionned by the government like FTDA, Croix-Rouge, Coallia, Emmaüs solidarité…). This legal assistance service is set up by volunteer activits an by associations (ADDE, ATMF, Dom’asile, ELENA, GISTI, La Cimade). In order to apply for asylum in France, you must first of all report to a first reception center (Spada or Pada). You may not go directly to the prefecture or to the Ofpra (French office for the protection of refugees and stateless persons). Note: In the Paris metropolitan region (Ile-de-France), a new system is in place since the beginning of May 2018 for applying for asylum. To get an appointment at the Spada. You first have to call a number managed by the Ofii (French office for immigration and integration). The agent will ask you some questions about your date of entry into France, your civil status and the civil status of your family accompanying you and your state of health, etc. Then they will send you a text message confirmation to the phone number that you give them, with the date and time of your Spada appointment. The Ofii gives out brochures explaining the proceedings but translations are not provided in all relevant languages (www.ofii.fr/demande-d-asile). Certain translations are available by telephone (English, Arabic, Dari, Pashto, Spanish, Tamil, and Mandarin). If you don’t speak any of the available languages you can try to get translation help from certain day-centers. The number you must call (01 42 50 09 00) is difficult to get through to. The “dematerialization” (paperless system) of the appointment booking system put in place in many police prefectures makes the asylum seekers waiting to apply invisible, and also makes it impossible to argue if there is any problem. Warning: It is important to not miss your appointment at the Spada at the correct date and time. You must go as soon as possible to the Spada. Even though there is no time limit for requesting asylum and you can request asylum even after years of living in France, if you say that you arrived in France more than 90 days ago, the prefecture will place you in the fast-track process (factsheet no. 2-1). This fast-track process is less favorable for you. Each Spada is managed by an association which works on behalf of the French government. Its role is multiple since it must inform you about asylum, give you the necessary documents to file an application for protection, and help you with the asylum application procedures, especially if you are not living in a housing center. The Spada must inform you about asylum and provide you with the information documents produced by the Ofii (The French office for immigration and integration), a government body (factsheet no. 2). The Spada must help you fill out the asylum request registration form and check that the file is complete, in order to send it to the prefecture. The form and a photo taken by webcam will be sent to the prefecture. Note: even if you do not possess a passport or identity card, the Spada must register your asylum request and note the information you provide orally. The questions about your journey are to check if you have travelled through other countries of the European Union in order, if this is the case, to apply the so-called “Dublin” procedure (factsheet no. 3). Some police prefectures will only place you in the Dublin procedure if your fingerprints are in a file, while others also use what you have declared during the interviews. If you do not want to answer these questions or if the prefecture realizes that you have given false information, the prefecture can decide that you do not wish to “cooperate” and can place you in the fast-track procedure, which is not in your interest (factsheet no. 2). The Spada must obtain an appointment for you at the prefecture service window called GUDA within 3 days (or 10 days if the number of asylum seekers is particularly high) and to provide you with a notification of this appointment. Warning: this can take a long time in some police prefectures – you should in this case make contact with an association to see if an appeal is possible. Provide you with special assistance (vouchers, food parcels) and direct you to the municipal reception service if necessary (CCAS or Municipal center for social action). The Spada has the obligation to help you, as this organization is financed by the government with a contract requiring it to fulfill certain tasks. If the Spada does not help you enough, after being registered by the Spada, you can contact an association which helps asylum seekers. Following the new contract bid made by the Ofii, the Spadas are also responsible for accompanying and domiciling beneficiaries of international protection. In order to remedy the malfunctions of the reception procedure, the state set up a second system giving access to the asylum procedure which is spreading to the entire French territory. It’s composed of centers of reception and examination of situations (CAES). In some regions in particular in the Hauts-de-France and Ile-de-France, CAES have opened to provide shelter and an examination of the administrative situation as soon as possible, before directing asylum seekers, more or less quickly, towards housing depending on their administrative status (see the Cimade’s map to know their locations). Each CAES as a specific reception capacity. The stay should not exceed ten days in theory. In practice, the stay is longer because of the recurring lack of housing spaces for asylum seekers in France. Depending on their administrative situation, asylum seekers can be sent to centers which can have a coercive functioning. 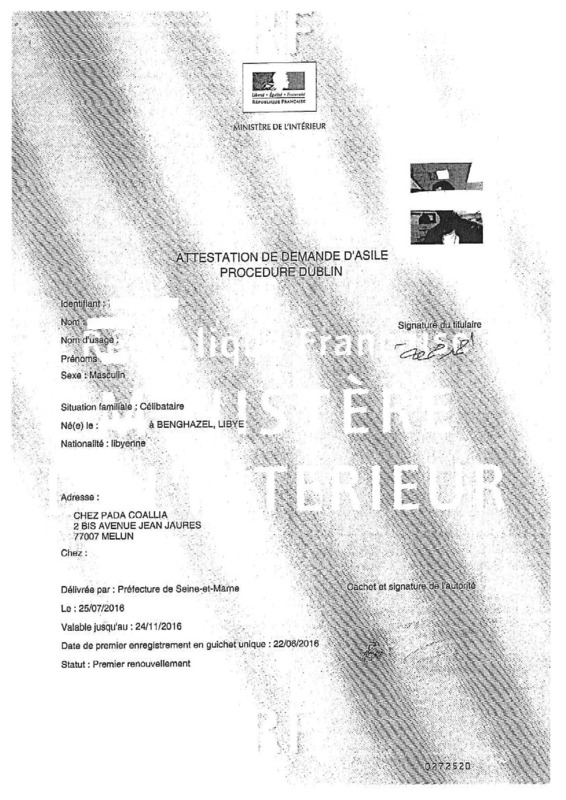 People in the Dublin procedure who go through a CAES in the Parisian region are, most often, hosted in centers located in Ile-de-France which can be “house arrest” centers in which id checks and arrest can take place. If those centers are full, people are sent outside of the Parisian area to centers of reception and orientation (CAO) or directly to one of the Pradhas, centers aiming to facilitate deportations of persons in the Dublin procedure. In Ile-de-France, in order to access a CAES, you must either go through one of the three day-reception centers for isolated persons (see below) or be spotted by a roving street team. This new preliminary step makes it impossible to have a direct access to a CAES. This allows the government to avoid the formation of waiting lines in front of centers, such as the ones formed in front of the former reception center at La Chapelle (the former “bubble”). All of this once again allows the government to make asylum seekers invisible and to hide the fact that France has a deficient reception policy. After the reception platform – Spada (factsheet no. 1), you must go to the Guda at the date of the appointment given to you by the Spada. In France, there are 34 one-stop services. The police prefecture is responsible for your right to residence. Even if you do not have a passport or a national id card the police prefecture must record the information that you provide orally. Do not miss this appointment because it will be difficult to obtain another one. You must communicate, if needs be, any change of address or “domiciliation” to the police prefecture by registered letter with delivery receipt. Warning: You will be informed at the police prefecture of the languages in which the Ofpra interview can be conducted. You need at this moment to indicate which language you choose. This language will be used during the whole length of the procedure. If you don’t choose, or if your language choice is “not available”, your interview could take place in a language of which you have sufficient knowledge (Ceseda, Art. L. 741-2-1). The only possible appeal (against this choice of language) can be made in front of the Cnda during an appeal of a rejection by the Ofpra. It is better if you ask for an interpreter for your native language. Do not choose a language which you do not speak perfectly. At the prefecture, your fingerprints will be taken to see if you are registered in the Eurodac and Visabio files. The police prefecture has to give you a brochure explaining why your fingerprints are taken entitled "I asked for asylum in the European Union: which country will handle my request?". The prefecture will also look for other evidence (or signs) of passage through another country of the European Union: you will be asked questions about your journey, your passport will be examined (to see if there is a visa for any other European country), as well as any other documents that you provide them. If your fingerprints are stored in a Eurodac file, or if the police prefecture finds another indication of your passage through another European country, you will be transferred into the “Dublin” procedure (factsheet no. 3). If the prefecture finds no proof that you have traveled through another country of the European Union, you can apply for asylum in France. Note: before your appointment at the prefecture, you cannot find out if you are in a Eurodac file or not. The countries that you have traveled through (Italy, Hungary, etc.) and in which you have gone through screening may not have recorded your fingerprints in the file. Note: if you refuse to provide your fingerprints at the police prefecture, you will be automatically placed in the fast-track procedure (see below). Some police prefectures refuse to register asylum requests if your fingerprints are unreadable, but this is illegal; you have to contact an association or a lawyer to challenge this kind of practice. The prefecture must provide you with a copy of the Interior Ministry’s Guide for asylum seekers of the in a language that you understand, and a list of associations that can help you. You can be placed either in the ‘normal’, ‘fast-track’ or “Dublin” procedure (“normale”, “accélérée” or “Dublin”). Warning: the fast-track procedure is not in your interest (quick and superficial examination of your request). you ask for a reconsideration of your request. The Ofpra can also place you in the fast-track procedure after examining your story. The prefecture must provide you with a document that explains why you have been placed into the fast-track procedure. Ask for it if they do not give it to you! Note: No appeal is possible against placement in the fast-track procedure. You can only appeal this decision before the Cour nationale du droit d’asile (CNDA - factsheet n°5). If you have been wrongly placed in the fast-track procedure, it is nevertheless possible to send a letter to the Ofpra to request that it transfer you to the normal procedure. According to the law, the Ofpra has only 15 days to decide your fate, but the delays are longer in practice. Especially in the fast-track procedure, it is essential to carefully prepare your written asylum story on the Ofpra form and to prepare for your interview (factsheet n°4). If your asylum application is rejected by the Ofpra and you are in the fast-track procedure, only one judge will examine your appeal to the Cnda (instead of 3 in the normal procedure). This judge makes their ruling within 5 weeks instead of five months, which means there is less time to examine your appeal. Currently this time limit does not have to be respected. In addition, it is possible for the Ofii to use your placement in the fast-track procedure to refuse to provide you the material reception conditions (CMA), specifically housing (see below) and the allowance (ADA). It is necessary to check in this case that the law indeed allows this reason as justification for taking away the CMA. The prefecture will provide you with an “attestation de demande d’asile” (asylum application certificate), valid for 1 month, which will indicate in which procedure you have been placed (“normal”, “fast-track” or “Dublin”). This document proves that you are an asylum seeker: you must have it on your person in case you are stopped and checked by the police (the original or a photocopy). Note: the prefecture will provide you, in addition to the certificate, a renewal appointment date. It is possible for the date of this appointment to be beyond the period of validity of the asylum application certificate, but your protection will still be maintained. Proof of residence or proof of postal address (from a “domiciliation”) not more than 3 months old. In the normal procedure, the second asylum application certificate is valid for 9 months, then renewable every 6 months. In the fast-track procedure, it is valid for 6 months, then renewable every 3 months. Note: in some prefectures (for example Paris),if your certificate is going to expire you must report to the prefecture to request a renewal before the end of the certificate’s period of validity. In the case of an appeal to the CNDA, the certificate will only be renewed upon presentation of the certificate of receipt of the appeal to the CNDA. The asylum application certificate does not permit you to freely travel in other countries of the European Union. Warning: It’s useful to keep copies of all your documents, especially certificates of asylum application, because if the prefecture illegally takes them away from you, the lawyer will be able to use the copies. if the person is subject to a definitive extradition decision. if the Ofpra has made a decision rejecting or declaring ineligible an asylum application made by a person subject to an deportation order (other than an OQTF), a sentence banning that person from French territory or an administrative ban from the territory (Ceseda, Article L.743-2, 8 °). an administrative ban from the territory can be pronounced in the event of a real, present and sufficiently serious threat to a fundamental interest of society or serious threat to public order, the internal security or the international relations of France (Ceseda, Art. L. 214-1 or L. 214-2). Article L. 743-3 provides that a person whose asylum application has been definitively rejected or who has lost the right to stay in the territory for one of the reasons listed in Article L 743- 2 must leave French territory, "under threat of being subject to a measure of removal" (in practice an OQTF). A person whose asylum application is still under examination by the CNDA but who has lost their right to stay in the territory because of one of the new cases added by the law of September 10th 2018 (see part b above) may request that the administrative court suspend the removal order following the loss of the right to stay, pending the decision of the CNDA. For example, a person who has been rejected by Ofpra and comes from a safe country of origin will lose their right to stay and the prefecture will withdraw their asylum application certificate. An OQTF will be issued but this person can then ask the court to suspend the execution of this OQTF while the Cnda examines their appeal. The person who is the subject of an OQTF for one of the reasons of loss of the right to stay added by the law of September 10th 2018 (see part b. above) may be placed under house arrest for a period of 45 days renewable once ; they can also be placed in detention (Ceseda, Article L. 744-9-1). If the person had previously been the subject of an OQTF (before their asylum request), and if they are detained or placed under house arrest, they can also ask the TA (administrative court) to suspend the execution of the deportation order until the decision of the CNDA has been made (Ceseda, Art L743-4). Note: Specific and broader measures are aimed at persons subject to an deportation order, a sentence of banning from French territory or an administrative ban from the territory (Ceseda, Article L743-2, 8 ° and Art L.571-4). If the person was already subject to a deportation order, an administrative or judicial banning from the territory, it can request that the TA (administrative court) suspend the execution of the measure within 48 hours of notification of the decision of rejection or ineligibility by the Ofpra (Ceseda, Art, L. 571-4). The prefecture must also provide you with the Ofpra form (factsheet no. 4-1). Warning: It’s advised to send your file to the Ofpra as a registered letter with delivery receipt in order to have proof of your submission. You will thus be able, if the Ofpra didn’t send you a registration letter in time, to go to the prefecture for the renewal of your certificate with the copy of the proof that you sent the file. The Ofii (French office for immigration and integration), a government body under the authority of the Interior Ministry, is responsible for providing access to “material reception conditions” (housing, allowance, postal address, vulnerability). No matter which procedure the police prefecture has placed you in (normal, fast-track or Dublin) you have the right to these provisions called CMA, except in certain cases listed below. Warning: the Ofii will offer you the chance to sign the “offre de prise en charge” (a formal agreement for assistance) to obtain housing and the asylum seeker’s allowance. If you accept this agreement, you may be allocated housing and the allowance (ADA). This is a global offer, so if you refuse one part of it, you will not have the right to any of the other parts. Accepting the offer of care now means that the Ofii can force you to go to another region (a region of residence) without necessarily offering you housing there. If the number of asylum seekers residing in a region exceeds the proportion set for this region by the national scheme for the reception of asylum seekers and the reception capacity of this region, you may be transferred to another region where you are required to reside while your application is reviewed. It will not be possible to leave your area without warning the Ofii and obtaining an authorization from them. Note: These proposals must take into account your personal and family situation; do not hesitate to give the authorities information that could justify your orientation towards a specific region or another. The Ofii will give you a personal interview to see if you are a "vulnerable" asylum seeker (see the form). For example, a person with a disability, a pregnant woman, a sick person, etc. are considered "vulnerable". You will be a priority for housing and it will have to be appropriate for your condition. At any time during the procedure you can report a situation of vulnerability to the Ofii. The Ofii must offer you a housing proposal based on the available places in the reception centers for asylum seekers (Cada). To do this, it consults the DN@ file (national file for place management). If there is no place in a Cada, the office could offer you housing in an AT-SA (temporary reception center for asylum seekers, a kind of emergency housing), in a Huda (emergency housing for asylum seekers), in a Cao (reception and orientation center) or in a Prahda facility (reception and housing program for asylum seekers). The Cada, At-sa and Huha host a majority of families. While the Pradha and Cao host a majority of single people, almost half of them people in the Dublin procedure. Note: in Île-de-France, you might also be offered a place in a Chum (emergency shelter for migrants) managed by the police prefecture of Ile-de-France. These centers house single people, mostly in the Dublin procedure. Also in this region, a specific system of housing places has been developed dedicated to the house arrest of the people in the Dublin procedure (Cara). If the Ofii does not offer you any housing, it redirects you to the Spada. You will be told to call 115 to find your own emergency housing. These reception centers may have different operating rules but they are subject to certain obligations (defined by their contract with the government), particularly concerning administrative, medical and social assistance. It is planned to unify their operation. In each of these centers, an end to the housing provided to you should follow a particular procedure allowing you, most of the time, to have a delay before your being put into the street. Before leaving the center, you can check with an association that your center is actually following the correct procedure. In a Chum, it is possible to challenge being put into the street1. If you are provided with “long-term” housing in a center, you will be able to use this address for your asylum procedure. If you are not housed in a center that can give you a postal address (though “domiciliation”), you must return to the Spada (factsheet no.1) which will provide you with a postal address at which to receive your mail. Warning: you must collect your mail regularly (once a week) or check the website regularly. If you do not go to the Spada for one month, the Spada can close your address (unless this absence is justified). The Ofii will provide you a cash withdrawal card for this allowance usable in ATMs (cash machines). It is nonetheless advisable to open a bank account (at the ‘Banque postale’). To open an account, you need the asylum application certificate and a valid address. In case of any difficulties, you can contact the Spada. The ADA amount is 6.80 euros per day for a single person. It is calculated based on the number of family members (for 2 people 10,20 euros; for 3 people 13,60 euros...). An additional amount of € 7.40 per day will be paid to you each month if no housing has been offered. If you indicate that you are housed somewhere for free, this additional amount will be withdrawn. From now on, asylum seekers sleeping in emergency housing will have this additional amount withdrawn (even if it is only temporary housing) because the services responsible for the management of emergency housing (SIAO) will have to inform the Ofii every month who are the refugees and asylum seekers they house, and in fact, those people do not have the right to additional amount for the housing. Respect your appointments by presenting yourself to the authorities (police prefecture, Ofii, house arrest...) and give them all the requested information. if the person does not comply with the requirements of the asylum authorities, including going to interviews, presenting themselves to the authorities and providing relevant information to facilitate the proceedings. In these cases, Ofii is no longer required to deliver a written and motivated decision. There will not be an opportunity for the person to submit written observations. The decision extinguishing the material reception conditions takes effect from the date of its signature. It can be contested within two months. The appeal must be preceded by an administrative appeal to Ofii’s Director, who has two months to decide. If there is no answer within two months, the appeal is considered to be rejected. A negative decision, which must be motivated, may be challenged before the administrative court (TA). b. Ofii suspends the benefit of material reception conditions when the person is incarcerated or subject to detention (CRA). c. Ofii may refuse or withdraw the benefit of material reception conditions in several situations (Article L. 744-8 of Ceseda). in the case of fraud (section D. 744-36). The decision terminating the CMA based on Article L. 744-8 must be written, motivated and taken after the applicant has been able to submit to the French Office of Immigration and Integration written observations within fifteen days (Article D. 744-38). The vulnerability must be taken into account and in the first 3 cases below, the reimbursement of the ADA already collected will be demanded. It is possible to point out that the person’s vulnerability should be taken into account throughout the procedure. if the administrative court (TA) has rejected the appeal against the OQTF or rejects the request to suspend the execution of the expulsion order. in the case of fraud (Article D. 744-37). Ofii tends to cut the ADA erroneously. Important case law exists at the level of the administrative courts and the Conseil d’Etat. People in “Dublin” procedure may be placed under house arrest or placed in detention and their ADA may be replaced by material assistance (Ceseda, Article L. 744-9-1). You will receive ADA throughout the asylum procedure, at least as long as you have the right to stay in France or until your transfer if you are in “Dublin” procedure (factsheet no.3). The payments will stop the month following the end of your right to stay in France. > For more details see: Gisti, Les notes pratiques, L’accompagnement des demandeurs et demandeuses d’asile en procédure « Dublin », avril 2018. (Gisti, Practical guides, Accompanying asylum seekers in the Dublin procedure, April 2018). According to the rules of Dublin III, only one Member State is responsible for the assessment of an asylum request in the European Union. If you didn’t ask for asylum elsewhere, “the Dublin III” regulations provide criteria that will enable France to determine the country responsible for the asylum request. For example, it can be the country which issued your first visa or a residence permit, or the country through which you entered the EU in and in which you first had your identity checked. This responsibility of member states ends twelve months after the date of an illegal crossing of the border. Other criteria, more positive, are provided such as the being a minor or having family in France (articles 7 to 17 of theAppel à soutiens ! regulations). the Eurodac file in which your fingerprints are recorded if they were taken in one of the 28 Member State of the European Union or the 4 associated countries: Norway, Iceland, Switzerland and Lichtenstein. Note: Although EU member states now almost always record fingerprints in the Eurodac file, it still sometimes happens that fingerprints are not correctly recorded, or even not recorded at all. persons apprehended while illegally crossing an external border (category 2 – fingerprints kept for 18 months). Persons who are illegally in the territory of a member state (category 3) can also have their fingerprints checked and compared, but their fingerprint will be destroyed after being compared. Warning: in some prefectures, you can be placed in the “Dublin” procedure solely on the basis of your declaration at the Guda police prefecture service window. The prefecture will look very carefully at your journey before arriving in France and the visa in your passport if you have one. However, in most services you will not be placed in the “Dublin” procedure solely on the basis of your declarations, but only if your fingerprints are registered in Eurodac or Visabio, no matter what you have declared. Note: your fingerprints will be taken during your first appointment at the Guda. Refusing to give your fingerprints does not justify the prefecture refusing to record your request, but they will place you in the fast-track procedure. It is possible to make suspensive proceedings (“référé-liberté”) before an administrative court (TA) to challenge the refusal to record an asylum request with the help of an association or a lawyer. ill treatment you have experienced while in the EU country to which it is intended to return you. Note: If you provide this information at the time of the interview, we also advise you to send it as soon as possible to the prefecture by registered letter with delivery receipt. You will then have proof that you have provided this information and, in the case that you appeal the decision to transfer you to another country the lawyer or association representing you can use it. Noting the “weak results” in terms of the application of the “Dublin” regulations and “of the execution of transfer decisions”, the French authorities started an experiment in 2017, consisting of entrusting specialized poles in the regional prefectures with processing the Dublin procedure. Two decrees were taken in 2017 and renewed in July 2018 to try out managing Dublin procedures in this way in Provence Alpes Côte d’Azur and in Hauts-de-France. A decree of the month of August 2018 expanded this experiment to Burgundy-Franche-Comté. Then, several decrees taken in October 2018 generalized this regionalization. From now on, once the Guda has registered the asylum application, people in the Dublin procedure then have to go to one of the 10 specialized regional hubs called regional Dublin hubs (PRD) to have their "Dublin procedure" asylum application certificate renewed. It is thus the same prefect who will continue the implementation of the Dublin procedure and will make the decisions for transfer and house arrest where applicable (in all departments within the purview of the hub) during the determination of the responsible country. The PRD will also take care of organizing the transfer in connection with the border police. The circular of July 30th 2018 lists the competent prefectures for applying Dublin regulations, and the numbers of civil servants allotted to the PRDs. Sometimes located several hundred kilometers from people’s place of residence, the prefecture must pay for transportation costs. A note of July 6th 2018 on the fluidity of housing for asylum seekers specifies the housing arrangements for persons in the Dublin procedure, stating that they are "preparation for the execution of the transfer". The Interior Minister asks the prefect to take the decision to transfer as soon as possible, and to provide housing within 130 km of the prefecture, otherwise the Ofii will transfer people to closer housing. During the “Dublin” procedure, France and the country responsible for your request have deadlines to respect (a time limit to contact the other country’s authorities and a time limit to answer). 3 months 1 month 6 months ((1 year in the case of imprisonment; 18 months in the case of escape) - If appeal is rejected by administrative court: the time limit starts over. * Category 1: fingerprints of all those who have applied for asylum in Member States. ** Category 2: fingerprints of persons who have been apprehended during illegal crossing of the external border of a Member State. There is also a category 3: fingerprints of persons who were illegally in the territory of a Member State, when the competent authorities consider it necessary to verify the existence of a previous asylum application. Warning: if you go through a CAES (factsheet 1), your fingerprints may be taken for the first time; it is important to keep a proof of that fingerprinting because it proves the start of your “Dublin” procedure. In fact, after your transfer to another housing center (Chum, CAO…) in another department, the prefecture could start the procedure all over again, even though this should be against the rules. If you haven’t been transferred within 6 months starting on the day when the responsible country gave its consent (date stated on the transfer decision), France becomes the country responsible for your asylum request. You can also check the end of the 6-month time limit on the “laissez-passer” the prefecture has given you. If you made an appeal against the transfer decision, the 6-month deadline starts over again at the date of notification of the court’s decision (see E. Appealing a transfer decision). You will be declared to be “fleeing” if you missed one or more appointments at the prefecture, the Ofii, with the police or at the airport. In the last few months more and more people are said to be “fleeing”, and this happens as soon as the asylum application is submitted because the prefectures have been assigning more asylum seekers to house arrest, which requires them to sign in regularly at a police station. In addition, the appointment letters for the prefectures are sometimes written in such frightening terms (“appointment at the expulsion office, come with your luggage, go to the border police office in order for execution of the transfer”) that asylum seekers are afraid to go...and are declared to be fleeing. Warning: If you are declared to be “fleeing”, contact a lawyer or an association because it is possible to make an appeal to the administrative court to deny that you are fleeing (see the Gisti jurisprudence note and the model-letters for asking the court for interim relief). If you are declared to be “fleeing” and you do not appeal or you lose your appeal to the court, the amount of time after which France is again responsible for your asylum request becomes 18 months. You will have to wait 18 months to apply for asylum again in France. If you are declared to be “fleeing” the Ofii will stop giving you the ADA allowance. Regarding housing, it depends on the center in which you are housed: some will try to keep you as long as possible and some will not hesitate to kick you out. After 18 months, you can return directly to the Guda to submit your asylum application in France. It is possible the Ofii may then refuse to provide you with the material reception conditions. In this case, contact an association. You can be placed under "house arrest" ("assignation à résidence") during part of the procedure and even be placed in a detention center, before being sent to the country responsible for your asylum request. Detentions are more and more frequent, especially since the adoption of the law of the March 20th 2018 “for a good application of the European asylum system” legalizing detention for most people in the “Dublin” procedure, considering that there is a “non-negligible escape risk” justifying this placement. When the responsible country has given its approval,a transfer ruling is notified. You may contest this decision before the administrative court (this appeal suspending the transfer). You must present your case to the administrative court within 15 days of receiving the transfer decision. If you are placed in detention or house arrest you must bring your case before the court within 48 hours of receiving the transfer decision. Warning: requesting legal aid does not stop the clock for these deadlines Your transfer cannot take place either before the end of this period nor before a judge has made their decision. Before you start an appeal, you should contact a lawyer or an association that knows these procedures in order to judge how useful it would be. Certain procedural irregularities may allow the judge to annul the transfer decision (your right to be informed, translation). But it is also possible to use substantive elements, for example if you have suffered mistreatment in the country to which France wants to send you back, or if the reception conditions for refugees in this country are bad (failure of the state). Both of these types of arguments are important for challenging a transfer. > For more information on appealing a transfer decision, consult the practical note on the Gisti website: L’accompagnement des deman-deurs et demandeuses d’asile en procédure « Dublin » (Accompanying asylum seekers in the "Dublin" procedure). Appealing is a double-edged sword. If you appeal a transfer decision, the 6-month time limit to transfer you is not calculated starting from the answer of the responsible country but from the notification of the final court ruling. Therefore, the 6-month time limit begins “all over again” starting from the date of notification of the court ruling. Be careful then if the transfer decision was notified to you at the end of the “Dublin Procedure” (at end of the 4th or 5th month), as France will have a new 6 months to transfer you, starting with the notification of the decision. If the judge annuls the decision for strictly formal reasons (for example the obligation to inform was not respected), the prefect can still take another transfer decision in due form. If the decision was annulled for substantive reasons (for example an error made by the administration that cannot be "repaired", or if you have been subjected to mistreatment in the responsible country or that country has no "capacity" to receive you – failed state) the prefecture cannot issue a new transfer order. Thus, if the judge has annulled the transfer decision with an injunction to the prefecture to register the asylum application, the prefecture will have to obey it. Thus, after a hearing, even if the court has annulled the transfer decision, it is better not to show up, and to wait for the end of the initial period of 6 months before returning by oneself to the prefecture. In any case, consult an association or your lawyer before going there. If you already have appointments set in the framework of a transfer procedure, if the order was annulled, you legally have no obligation to show up for them. However, very often, if you do not show up for these appointments, the prefecture will declare you “fleeing” and you will lose the ADA allowance (factsheet 2). Warning: at the time of notification, some prefectures send asylum seekers directly to the administrative court to appeal. People then introduce a request—without really knowing it—by signing a very short form written in French. Then, a court-appointed lawyer (who does not necessarily know this type of litigation) will plead the case without the presence of the asylum seeker, and with very little information to defend you. After several weeks, a decision - often a rejection - will be notified by mail. It is important to be able to meet your lawyer in order to bring them useful information; if they do not call you, try to contact the court clerk to find out the date of the hearing which will generally be held a few days later. In case of an appeal of the court’s decision by the prefect or by you, the time period after which France becomes responsible for your asylum application will not be extended; the prefecture must register it, in principle in the normal procedure. If you wish to appeal the decision of the administrative court rejecting your request, you should know that judgment will take a long time. If you have the means to challenge this rejection, this recourse can be useful, in particular if you are later declared to be fleeing. If you are placed under "house arrest" ("assignation à résidence"), you will usually have to go to a police station, often twice a week or more, to sign a register. If you fear being arrested there, ask an association for advice before deciding, because not going could also have serious repercussions: being declared to be “fleeing” and having to wait 18 months without any rights before being able to ask for asylum in France. Appealing a "house arrest" decision will have the same consequences as appealing a transfer decision (the 6-month time period after which France becomes responsible for your request starts running again from the date of the court’s decision). Warning: The practices of the prefectures are quickly changing because of a clear intention to transfer more people or declare them “fleeing”. The choices you must make at the different stages (appeals, invitations to appointments) will have more or less significant consequences depending on the prefectures (arrest, being declared to be “fleeing”). Warning: If you haven’t been transferred at the end of the 6-month period starting on the day when the responsible country gave its agreement for your transfer, and you have not been declared to be “fleeing”, France becomes responsible for your asylum application. You can go back to the Spada or the prefecture depending on the regions (in the Parisian region you can go directly in the Spada without getting an appointment through the Ofii telephone number again). You can ask an association for advice. the prefecture accepts to register your application but places you again in the “Dublin” procedure; it appears that prefectures have been encouraged to do this. It’s possible to explain to the prefecture that you were subject to an obligation to leave the territory of the country to which you were transferred, or explain that the authorities forced you to go back to France. If you have kept some documents proving this you must bring them (decision of the country asking you to leave their territory, photos of the mistreatment you were subject to, etc.). It can also be useful to bring documents proving that you have strong links to France; they can influence the prefecture’s decision. Try to go to the prefecture with a person who speaks French well and can explain your situation. It’s important to always keep a copy of your obligation to leave the territory of the country initially responsible for your request, because some prefectures keep this document. If the prefecture doesn’t take it into account, you will be able to produce these proofs in front of the judge when you are appealing your transfer decision. the prefecture registers your asylum request but you are placed in the “fast-track” procedure (procédure accélérée) with the justification that you “failed to comply with the Dublin procedure”. In that case, contact an association to engage legal proceedings if, following this, the Ofii refuses to grant you the ADA allowance. finally, in the best-case scenario, the prefecture can register your asylum request in the normal procedure and hand you the Ofpra application file. A criminal punishment which already existed for others has just been extended to persons in the Dublin procedure (Ceseda, Art. L. 624-3): the court can sentence to three years’ imprisonment any person who has avoided or who has tried to avoid the execution of a transfer decision. This measure targets in particular persons who return to France after their transfer. Similarly, a transferred person who has re-entered France without authorization will be punished by three years’ imprisonment. After the appointment at the Guda, you must fill in the Ofpra (French office for the protection of refugees and stateless persons) asylum request form1 in French. Do not forget to date and sign it.You must then send it by registered letter with delivery receipt or hand it in to the Ofpra within 21 days of the date on which you obtained the asylum application certificate. Warning: if it is a reconsideration (second request), this time limit is only 8 days. Note: it is recommended to send the file to the Ofpra by registered letter with delivery receipt, in order to have a proof of submission. You may thus, if the Ofpra is late in sending out its asylum request registration letter, report to the prefecture in order to renew the certificate with the photocopy of the proof of submission of the file. Along with the form you must also send 2 recent identity photos, a copy of the asylum application certificate and any other document useful for your asylum story (see below). If you have a passport you must provide the original. Warning: you must keep photocopies of your entire file (Ofpra form, asylum story, accompanying documents). If the Ofpra considers that your file is complete, you will receive a registration of your asylum request letter. Warning: in order to reduce administrative costs and delays caused by postal notifications, the Ofpra can now notify in a dematerialized (paperless) manner its decisions granting or refusing protection, ineligibility, closure, withdrawal, and granting or refusal of statelessness. Until this change, the office could only do so by registered letter with delivery receipt, which applicants received at their place of residence or at their “domiciliation” postal address. Asylum story section: this is the most important section because an asylum request is a request for protection based on your life story and your fear of persecution (see below). The form can be completed at any time (up to the date of the Opfra interview). You must send any additional information and any copies of documents supporting your claim of fear of persecution by registered letter with delivery receipt to the Ofpra. Note: It is essential that you inform the Ofpra of any change of address by registered letter with delivery receipt. The Ofpra can close your application if you refuse to provide information regarding your history, your identity, your nationality, etc., or if you have not informed them of your address or place of residence within a reasonable time period and you cannot be contacted to examine your request. Following a decision to close your file, you may ask for it to be reopened within a period of 9 months. If you make a request for reconsideration without providing any “new evidence”. New evidence must be pertinent and must support your claims of “personal fears”. This new evidence must have happened after the procedure at the CNDA, otherwise you must prove that you had no knowledge of it before the hearing (Ceseda Art. L. 723-16). Your placement in the fast-track procedure will have already been decided at the Guda stage (even if it is in reality a decision officially taken by the Ofpra) if you come from a "safe country of origin" or if it is your second asylum application (reconsideration). If your declarations are “manifestly inconsistent and contradictory”. These cases are added to the other reasons for placing a person in the fast-track procedure (factsheet no.2). Regarding these complex concepts: please see the Guide for Asylum seekers produced by the authorities3 (in several languages). and finally, if your presence in France constitutes a serious threat to the security of the State, whether or not it has been subject to prosecution and / or criminal convictions. This may be serious threats to security of the State, a crime or offense constituting an act of terrorism, or serious threats to French society. For these last two cases, the person concerned must also represent a serious threat to society. From this story, the Ofpra must be able to see if your history justifies you being granted refugee status, and, if not, subsidiary protection. why you have been forced to flee your country and seek the protection of another country. You must also explain why you are being persecuted in your country of origin or country of residence, or the risks to which you are exposed as a result of armed conflict. Describing situations of troubles or war which may exist in your country is not enough: you must describe your personal history and convince the person who reads your story that you personally have been the victim of persecution, or that members of your family, people close to you, or comrades-in-arms have been killed or have been subject to persecution, which implies a threat to your own safety. Note: if you do not speak French, you must find someone who can translate your story into French. If the translation or interpretation conditions are not ideal, indicate this in your story. The Spada must help you to translate your story. your current family status: married or in a civil partnership or single, your children (age, gender), state if these members of your family are in France, remain in your country of origin, or if they are dead. according to your personal history, indicate if you have been subject to discrimination or persecution as a result of these activities, or because of your sexual orientation, your belonging to an ethnic group or your opposition to an arranged marriage, etc. Note: if you have been a member of an armed group and you have committed crimes, France can refuse to grant you refugee status. aspects of persecution related to gender and gender identity can be recognized by the Ofpra. what the outcome of these initiatives was. Note: in cases of physical and/or psychological after-effects, it is important to provide a medical certificate, even a recent one. the exact itinerary with the dates, the different stages, the means of transport used, the cost. why you would not be safe in another town or another region of your country of origin. Note: You must state what you fear at the present moment if you returned to your country (even if you left it a long time ago). You are not required to provide evidence of the different information in your asylum story: the most important thing is to provide a story that is sufficiently precise, consistent and non-contradictory, to be credible and to convince the Ofpra case officer. However, in addition to the information that you provide, do not hesitate to provide documents that support your credibility (witness statements, administrative documents, press articles, medical certificates, etc.). Warning: never include original copies of documents in the file (only copies). You will show the originals, if you have them, on the day of your interview. Note: you can find information in a guide made by the asylum network of Toulouse on gender-related persecutions. You will receive a notification to report to the Ofpra at the latest 15 days before the interview. Warning: the appointment letter will be sent to you by any means (email, text message/SMS, letter, etc. ); you must be vigilant and above all inform the Ofpra if you change your mobile phone number or e-mail address. The confidentiality and the actual reception of the appointment letter must be guaranteed. if, for serious medical reasons beyond your control, you cannot attend this interview. In this case, you must send medical evidence by registered letter with delivery receipt to the Ofpra as soon as possible. If the Ofpra decides that your request is ineligible or decides to close your file (see above), you will not be asked to attend this interview. The interview is very important: it is conducted by a protection officer responsible for recording your asylum story and for making a positive or negative decision. It is extremely important that you prepare for this meeting with an association, or at least with friends, before going to the Ofpra. The interview is crucial because it is at this point that everything is decided: you must convince the Ofpra officer that you need protection. Note: the interview can take place in the Ofpra offices in Fontenay-sous-Bois or on the spot in certain cities during one of Ofpra’s tours (“missions foraines”). The officer will ask you questions to obtain more details about your asylum story. If they do not ask you questions, describe yourself the event which forced you to leave your country (see above). Warning: You must state what you fear at the present moment regarding a return to your country (even if you left it a long time ago). In principle, the officer must ask you at the end if you wish to provide other information regarding your history or to complete your declarations. If you have something more to say, do so at the end of the interview. the interpreter in the language indicated on the Ofpra form. It is recommended that you request an interpreter who speaks your native language (specify your dialect). This will avoid a direct translation by the protection officer into a language that you have less knowledge of. your family members: in principle, you are interviewed without the presence of your family members. But if the Ofpra deems it necessary, it can undertake a complementary interview in the presence of your family members. Note: the interview is recorded, wherever possible. You will be informed of this. You can obtain access to the recording. The interview is transcribed in an (unchangeable) report which is sent to you with the decision. The Ofpra must as a rule make its decision within 3 months of the date of the interview, but this period can be longer. In the case of a fast-track procedure, the period is 15 days in theory but, in reality, much longer. The officer will check if your story is consistent with the situation in your country of origin. Next, they will study your asylum request to see if you fall under the definition of refugee status according to the Geneva convention– articles 1 and 2 (10-year residence permit) or if you may benefit from subsidiary protection under article L.712-1 of the Ceseda (4-year residence permit). Note: You can find information on the administrative procedures you need to undertake after obtaining refugee status in a guide produced by the Welcome Bordeaux association. The decision must be justified when it is negative: it includes a summary of the reasons for which the Ofpra has not granted protection. Warning: the Ofpra can now notify in writing by any means its decisions granting or refusing protection. Until recently, the office could do it only by registered letter with delivery receipt. In case of rejection, the date of reception of the decision is fundamental because you have 1 month from this date to make an appeal (factsheet no. 5) and only 15 days to request legal aid. It is therefore vital to immediately inform the Ofpra if you change your address. If your asylum request is rejected by the Ofpra, you may appeal this decision before the National court of asylum law (CNDA). The appeal must be submitted within 1 month of the date on which you received the decision. Warning: the registered letter from the Ofpra informing you of refusal of asylum must be collected from the post office within 15 days. If not, it will be returned to the Ofpra and the date taken into account for the appeal will be the date of delivery of the registered letter that was not picked up. Although not required, it is advisable to take on a lawyer. You can request legal aid to have a free lawyer. The request must be made to the CNDA, at the “bureau d’aide juridictionnelle”, 35 rue Cuvier 93558 Montreuil-sous-Bois cedex. You can fill in the legal aid (AJ) form (Cerfa n° 12467*02) or make the request on a blank sheet of paper. This request can be sent by fax to: 01.48.18.43.11. Do not forget to attach a copy of the Ofpra’s refusal decision. The request for legal aid must be received by the legal aid office within 15 days of notification of the Ofpra decision. After 15 days it is too late to apply for legal aid, even when lodging the appeal. The 15 days start running from the distribution date of the registered letter by the post office (www.csuivi.courrier.laposte.fr/suivi). The legal aid request is suspensive: the 1-month time limit for making the appeal stops running while the legal aid office examines your request, but will resume starting from the notification of the decision ruling on the legal aid application. In other words, the time limit will resume running from the number of days it was at when the legal aid request was made. For example: the Ofpra decision is notified on January 1st 2019 and the legal aid application is submitted on January 7th 2019. The time has therefore run for 6 days. If the legal aid office makes its decision granting legal aid on the 1st of February 2019, the deadline for making the appeal starts running again on that day and will therefore be 25 days. As a precaution, it is thus safer to introduce the appeal as quickly as possible or at least within 15 days of the legal aid decision. Warning: After 15 days, no more legal aid requests will be accepted, and 1 month after the notification, it is no longer possible to appeal. The legal aid office will appoint a lawyer to assist you throughout the process. You can also choose your own lawyer if they accept legal aid. You must go see them quickly so that they can request legal aid and make the appeal. The appeal must be written in French and sent to the CNDA by registered letter with delivery receipt or by fax (01.48.18.44.20). You may also submit the file directly on site, at the court clerk’s office. The appeal must include your first name and surname, date and place of birth, nationality and your address. It must explain the reasons for which you are appealing the Ofpra decision. It must include responses to the parts contested by the Ofpra, or things you forgot, describe your political activities, provide more information on a timeline contested by the Ofpra, amend incorrect data in the written request or during the interview with the Ofpra, etc. You can send supporting evidence or documents up to the closing date of the appeal appraisal period indicated on the appointment letter by registered letter with delivery receipt or by fax (01.48.18.44.20). You must note the appeal registration number in your letter. If you have a lawyer, you should decide together whether or not to add any documents to the appeal. The judges will examine these documents carefully: particularly their date, their author and the means by which they were obtained. The judges will ask you questions about these documents. You can for example, add documents produces in your country or in France, which confirm your fears due to political activity or a particular situation (proof of militant political activity, religious practice, homosexual relations in France, etc.). You can also send medical certificates which provide evidence of wounds or scarring. The judges will take these into account. Note: Do not attach evidence which has no relevance to the request for protection, for example, a medical certificate proving that you are ill or evidence of your integration in France. If the additional document was sent to you by a third party and you have doubts about its authenticity, it is preferable not to include it in your file. You must have any documents written in a foreign language translated into French. If you include excerpts of association reports or press articles about the situation in your country, it is preferable to have them translated into French (free translation) or English. Legal or civil status documents must be translated by accredited translators (paid translation). The judges may take into account free translations but if these documents are important for your case history, it is preferable to have them translated by an accredited translator. You can get a list of accredited translators from the courts or ask associations. When you submit your appeal, the CNDA will send you a receipt with a file number which will allow you to renew your asylum application certificate. In theory, the appeal before the CNDA is suspensive: you cannot be sent back to your country before the CNDA has made its decision. However, in certain cases, this appeal is not automatically suspensive when the right to stay is refused (factsheet 2). if the person is the subject of a definitive deportation decision. if the Ofpra has taken a decision rejecting or deeming ineligible an asylum application made by a person subject to an expulsion order (other than an OQTF), a sentence of banning from French territory or an administrative banning from the territory (Ceseda, Art. L.743-2, 8 °). the decision will be made by a single judge within 5 weeks. However, these time-limits are only indicative. The hearing is public but you can ask – if you deem necessary – for a closed hearing (non-public session), especially if you are a minor. The CNDA court is located in the Paris region (Montreuil, Seine-Saint-Denis): you must plan ahead for transportation costs in order to be present at the hearing if you live far away. Your presence at the hearing is very important. You can ask the organization that hosts you if it can cover these costs. Warning: you must prepare the hearing with your lawyer well in advance; re-examine your asylum story, the issues that caused a problem for the Ofpra and your fears of returning to your home country at the current time. If you live in the Paris region, you can go watch the CNDA court hearings to see how they work. Warning: the hearings may also take place by videoconference (that is to say at a distance, the asylum seeker, their lawyer and the interpreter will be in a room elsewhere, and connected by video to the CNDA court where the judges are). You cannot refuse this use of videoconference. The CNDA court’s decision is posted on the ground floor of the court (in Montreuil) and sent 3 weeks after the hearing by registered letter, or 1 week in the case of a fast-track procedure. If the CNDA grants you refugee status or subsidiary protection, the prefecture has to send you a certificate valid for 6 months which allows you to stay in French territory. If the Ofpra has granted you subsidiary protection, you may appeal this decision before the CNDA court and request refugee status. You will in any case keep your subsidiary protection. The right to stay in the territory ceases as soon as the CNDA’s decision is read in open court or upon notification of the decision if the application has been rejected by decree (without a hearing). You can appeal to the Conseil d’État within a period of 2 months, however this appeal does not stop the clock. The Conseil d’État will not reconsider your asylum story but only if the procedural rules have been correctly observed by the CNDA. Note: this appeal is quite difficult to make and has little chance of succeeding. Furthermore, you will have to pay a lawyer attached to the Conseil d’État who will be more expensive (legal aid will be very difficult to obtain). You can request a reconsideration of your asylum request if you can provide new information (either new information which happened after the CNDA hearing, or that you did not have knowledge of before the hearing, or new evidence relating to a disputed fact in the first request). Any new fact must be relevant and must reinforce your argument about personal fear of persecution. In this case, you must report directly to the prefecture (without going to the Spada). If the Ofpra refuses your request a second time, a new appeal before the CNDA is possible, within a period of 1 month. In this case, it is recommended to prepare your story before taking the steps at the Spada because the Ofpra form will need to be handed in within 8 days. If the story is unconvincing and does not showcase any new information, the Ofpra can make a decision of ineligibility without inviting you to an interview. If the CNDA rejects your request, the prefecture will automatically, and without waiting to notify the CNDA’s decision, issue you an order to leave the territory. You can file an appeal against this order but only within 15 days. If your asylum application was registered after March 1st 2019 (application of the new law about residence of foreigners), the prefecture must inform you that you can apply for a residence permit at the same time as your asylum request. If you have not done so, an application for a residence permit after the refusal of asylum will only exceptionally be considered eligible by the prefecture, because it will be necessary to justify "new circumstances" to request to right to residence. If, at the same time as the asylum application, you filed with the prefecture an application for a residence permit on other grounds and if the prefecture refuses to give you this permit, the prefecture will then refuse you residence and issue an OQTF order. But it can also sometimes wait for the rejection of the asylum application to take an OQTF order. In this case, this OQTF order will be based on the rejection of asylum and you will have only 15 days to challenge it. In your appeal you will have to put forth both arguments related to the refusal of asylum but also to the refusal of residence. A single judge will then decide, following a "faster" procedure, on the rejection of the right to residence and the OQTF, and in case of rejection, the deportation measure may be executed. In this case, get in touch with a specialized association or an undocumented immigrants collective. All asylum seekers have the right to health insurance, even if you are in the “fast-track” procedure (factsheet 2) or the “Dublin procedure” (factsheet 3). You do not have to prove that you been residing in France for more than 3 months. You also have the right to free complementary health insurance (universal complementary healthcare coverage or “CMU-C”) if you have a low income (less than 725 euros per month approximately). Health insurance and the CMU-C complementary insurance allow you to avoid paying, and you do not have to pay any medical fees or medication costs up front. To obtain this, you must go to the health insurance office (CPAM) of your place of residence on the date indicated in the appointment letter that the Spada (factsheet 1) or the Ofii (factsheet 2) will give you. If the Spada does not give you an appointment at the CPAM, ask for it! Note: it is important to go to this appointment. If you do not, it will be difficult to obtain another one. The proof of residence that your accommodation center or the Spada gave to you. Note: You will be asked your income over the last twelve months, including what you earned in your home country. Don’t forget to convert into euros. When you have obtained health insurance and CMU-C complementary insurance, you can go to the doctor or hospital for free. You will need only to present the CMU-C paper certificate. If you do not have a valid certificate, you can apply for the AME (or “Aide médicale d’état”; another type of insurance for those not otherwise covered). the center which is housing you. While waiting to obtain health insurance, you can go to the departments for access to healthcare (permanences d’accès aux soins de santé [PASS]) which are present in some hospitals. A social worker will assess your social situation and help you find a doctor. The Reception and orientation center (Caso) tenus par l’association Médecins du Monde, 8-10 rue des blés 93210 La plaine Saint Denis run by the Médecins du Monde association: 8-10 rue des blés 93210 La plaine Saint Denis on Mondays, Tuesdays and Thursdays from 9.00 a.m. to 1.00 p.m. and from 2.00 p.m. to 5.00 p.m.; on Wednesdays from 2.00 p.m. to 5.00 p.m. and on Fridays from 9.00 a.m. to 1.00 p.m.
or the Reception, orientation and accompaniment center (CAOA), 15 boulevard de Picpus 75012 Paris (métro Bel-Air on line 6). You do not have the right to work during the first few months of your asylum request in France. If, after 6 months since filing your asylum application (until the 1st of March 2019, the delay is 9 months), the Ofpra has not made a decision on your asylum application, you can apply for a work permit. If you are appealing, as long as the CNDA court has not ruled on an asylum application, it is still pending. But French law only provides access to paid work during the Ofpra procedure. - Possibility 1 - your application has been rejected by OFPRA less than 6 the months (until the 1st of March 2019, the delay is 9 months) after filing your request, you have lodged an appeal with the CNDA and the court has not given its ruling yet: you cannot apply for a work permit. - Possibility 2 - your asylum application was registered more than 6 months ago (until the 1st of March 2019, the delay is 9 months) and your file is still being examined by the Ofpra. If you submit an application for a work permit, the administration must examine it even if you are subsequently rejected and you lodge an appeal before the CNDA. Several documents regarding the company. This file must be presented to the prefecture of the department where you live. The prefecture (specifically the “Direccte” or Direction régionale des entreprises, de la concurrence, de la consommation, du travail et de l’emploi) may grant or refuse a work permit (for example if there are many unemployed persons in France who could hold this position…). In case of refusal, you can appeal this decision before a court: to do so, contact an association for the defense of foreigners or a lawyer. As of March 1st 2019, the prefecture has two months to respond to a work permit application. In the event of no response within these two months, this means it has been implicitly approved (the authorization will be deemed to have been acquired). When you have obtained the work permit, you may begin working for this employer. Warning: you must not change employer; the work permit is only valid for the employment contract that you presented to the prefecture. At the end of your contract (fixed term, interim work), or in the case of involuntary loss of your employment (you are let go), you have the right to register with Pôle emploi (the French unemployment office). Asylum seekers may benefit from different types of vocational training (contact Pôle emploi for details). Unaccompanied foreign minors (MIE) taken care of by child welfare (l’Aide sociale à l’enfance) are entitled to a work permit if they present an apprenticeship or professionalization contract. If they apply for asylum, they must be allowed to continue their contract while the asylum application is being processed. Unaccompanied foreign minors ("mineurs non accompagnés” or "MNA") must benefit from child protection measures. You are classified as an unaccompanied foreign minor if you are less than 18 years old and you have no legal representative in France. France has the obligation to protect you until you reach adulthood (18 years old), even if you have not made an asylum application. You have the right to make an asylum request. However, you are advised to start by first requesting child protection measures from the ASE (Aide sociale à l’enfance) connected to the department where you live, which will take care of your housing, health insurance, and education. If you have identity papers, they will be examined. Warning: the ASE cannot refuse to offer you protection based solely on the reason that a member of your family is in France (but who cannot or does not wish to look after you) or that a person is providing you with temporary housing. 1. Where to go for an assessment interview? In certain departments, you must go to the Conseil départemental where the ASE is located. In Val-de-Marne (94), it is the “PEOMIE” : 6 rue Albert Einstein 94000 Créteil : 6 rue Albert Einstein 94000 Créteil. While waiting for your protection decision, the ASE must provide shelter for you. Two to three days after the interview, you must go to collect the ASE’s decision from the place where you had this interview. You can make a direct request to the children’s court to order the ASE to assist you. This procedure may take several months. You do not have to wait for the court’s decision to apply for asylum. If you live in the Paris area, you can get help in this process by going to the offices of the ADJIE (assistance and protection of young unaccompanied foreign nationals): 49 ter avenue de Flandres 75019 Paris (metro Stalingrad, lines 2, 5 and 7). In other regions, other associations can help you. Requesting assistance from the ASE does not prevent you from requesting asylum. The procedure is the same as for an adult. You must be represented by an ad-hoc guardian (AAH) to make and submit your request. The ad-hoc guardian (AAH) is an adult assigned by the justice system to represent you and assist you in your administrative procedures regarding asylum. The AAH does not necessarily have extensive knowledge of asylum procedures: you must ask for help from one of the specialist associations. The prefecture must contact the public prosecutor to request they provide you with an AAH (even if you are receiving assistance from the ASE). if you are considered as a threat to the public order, public security, or the safety of the state. You cannot be placed in the “Dublin” procedure and transferred to the first European country where your fingerprints were taken (factsheet 3). France must register your asylum request. You can ask to join a family member who has themself applied for asylum in another European Union country. As a minor, you cannot be placed in housing in an asylum seekers’ reception center (Cada), nor receive the asylum-seeker’s allowance (ADA) (factsheet 2) . Only the ASE can house unaccompanied minors. On your Ofpra form, do not forget to state the names, dates and places of birth of your partner or spouse, the date of your marriage, even if it was a religious marriage. Also state the names, dates and places of birth of your children. If you are not sure about a date, state “approximate date” in parentheses. your mother and father, as well as your brothers and sisters, if you are a minor and not married. Note: You can find information on the administrative procedures you need to undertake after obtaining refugee status ina guide produced by the Welcome Bordeaux association as well as on the Ofpra’s website (family reunification page). The marriage (or civil union or Pacs), must have taken place before your asylum request. In the case of common-law marriage, you must have had a stable and continuous relationship with your spouse (actual cohabitation). if you have subsidiary protection, they have the right, under certain conditions, to a 4-year residence permit, then a 10-year residence permit. You can request family reunification (“réunification familiale”): no conditions regarding income, housing, or ability to speak French or length of residence in France are required. As soon as you have been granted protection, the members of your family must request a long-stay visa from the French consular authorities in their country of residence. They must provide their passports, visa request forms (cerfa no.14571*02), the document proving your protection granted by the Ofpra and any documents which prove their family link to you: birth certificates, wedding certificates, identity cards, school records, photographs, etc. Other evidence may be requested regarding your family makeup. People who you know can attest to family links, by providing precise written witness statements, together with a copy of their identity documents. You can also provide detailed invoices of telephone calls, call logs for Skype and Viber, etc., letters, e-mails, receipts for money transfers, etc. Warning: the members of your family must request the visa from the French consular authorities in the country in which they legally reside or from the country whose nationality they hold. Note: if you make a trip to see your family in a country other than your country of origin, keep a copy of your travel documents with stamps on them, your plane tickets and your receipts. Take photos with your family, with the date on the photos. If you are an asylum-seeker or refugee and you are living in France, you have the right to marry and to make a civil union (Pacs). > for marriage see: Gisti, Le mariage des étrangers, coll. Les Cahiers juridiques, avril 2014. If you have subsidiary protection, your family members have the right, under certain conditions, to a 4-year residence permit. Warning: your marriage or civil union must have taken place more than 1 year ago and you must have been cohabiting continuously ever since. You can request “family reunification” like other foreigners. The conditions are strict: stable income (minimum wage at least), housing of a certain size. This request is submitted to the Ofii, and the decision is made by the prefect. Note: If you want to get married overseas, in order for your marriage to be recognized in France you have to publish the banns of marriage at the town hall of your place of residence and ask the French consulate of the country in which you were married for a certificate of legal capacity to marry (“certificat de capacité à marriage”). After the marriage you must request by registered letter that the Ofpra record it. Your marriage will not be recognized if you get married under a polygamous system. if you have subsidiary protection, they can be granted a 4-year multiyear residence permit. You can request “family reunification” for your mother and father, as well as your minor unmarried brothers and sisters. In case of refusal of a visa for your family, you can make an appeal, first before the Commission for appealing visa refusals (CRRV), and then before the Nantes administrative court. Contact an association for more information, but be advised that the deadlines for appeal are very short. Whether you are an asylum-seeker or a refugee, your children have the right to be enrolled in the schools located in your place of residence. For persons who benefit from protection in France, divorce is subject to French law. If one of the two persons does not have protection, they may be subject to the law of their country. It is therefore recommended to contact the appropriate migrant protection associations or comptetant lawyers.